Ihr werdet weinen und heulen (You shall weep and wail), BWV 103, is a cantata by Johann Sebastian Bach, a church cantata for the third Sunday after Easter, called Jubilate (Jubilate Sunday). 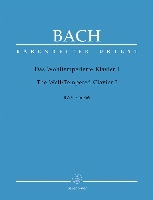 Bach composed the cantata in his second year as Thomaskantor in Leipzig and first performed it on 22 April 1725. It is the first of nine cantatas on texts by Christiana Mariana von Ziegler, which Bach composed at the end of his second annual cycle of cantatas in Leipzig. Based on the Gospel reading from the Farewell Discourse, where Jesus, announcing that he will leave, says "your sorrow shall be turned into joy", Bach contrasts music of sorrow and joy, notably in the unusual first movement, where he inserts an almost operatic recitative of Jesus in the fugal choral setting. The architecture of the movement combines elements of the usual concerto form with the more text-related older form of a motet. Bach scores an unusual flauto piccolo (descant recorder in D) as an obbligato instrument in an aria contemplating the sorrow of missing Jesus, who is addressed as a doctor who shall heal the wounds of sins. Bach scores a trumpet in only one movement, an aria expressing the joy about the predicted return of Jesus. The cantata in six movements closes with a chorale, the ninth stanza of Paul Gerhardt's hymn "Barmherzger Vater, höchster Gott". The cantata begins in B minor, illustrating sorrow, but in movement 4 shifts to the relative major key of D major, illustrating the theme of consolation in Ziegler's text. The opening chorus has an unusual structure, which includes an arioso passage for the bass voice. All instruments except the trumpet play a ritornello, after which a choral fugue pictures the weeping and wailing of the text in unrelated musical material, rich in chromaticism. 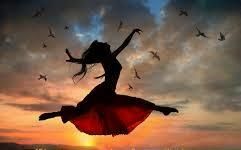 In great contrast the following line, "aber die Welt wird sich freuen" (But the world will rejoice), is conveyed by the chorus embedded in a repeat of the first part of the ritornello. 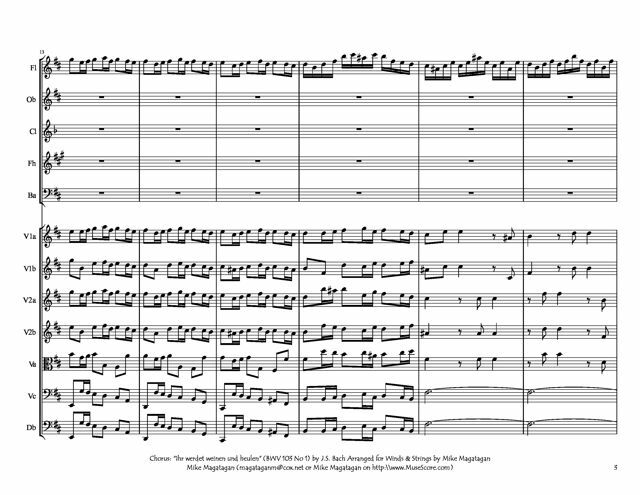 The sequence is repeated on a larger scale: this time the fugue renders both lines of the text as a double fugue with the second theme taken from the ritornello, then the ritornello is repeated in its entirety. The bass as the vox Christi (voice of Christ) sings three times, with a sudden tempo change to adagio, "Ihr aber werdet traurig sein" (But you will be sad) as an accompagnato recitative. Musicologist Julian Mincham notes: "This recitative is a mere eight bars long but its context and piteousness give it enormous dramatic impact. Bach's lack of respect for the conservative Leipzig authorities' dislike of operatic styles in religious music was never more apparent!" Klaus Hofmann compares the recitative's "highly expressive melody and harmony" to Bach's Passions. Finally, the extended sequence of fugue and ritornello with chorus returns transposed, on the text "Doch eure Traurigkeit soll in Freude verkehret werden" (Yet your sorrow shall be changed into joy). According to Alfred Dürr, the architecture of the movement is a large scale experiment combining elements of the older style of a text-related motet with the form of a concerto of instrumental groups and voices, as typically used by Bach. Movement 2 is a secco recitative for tenor, concluding in an arioso section with a "deeply moving" melisma on the word "Schmerzen" (sorrows). 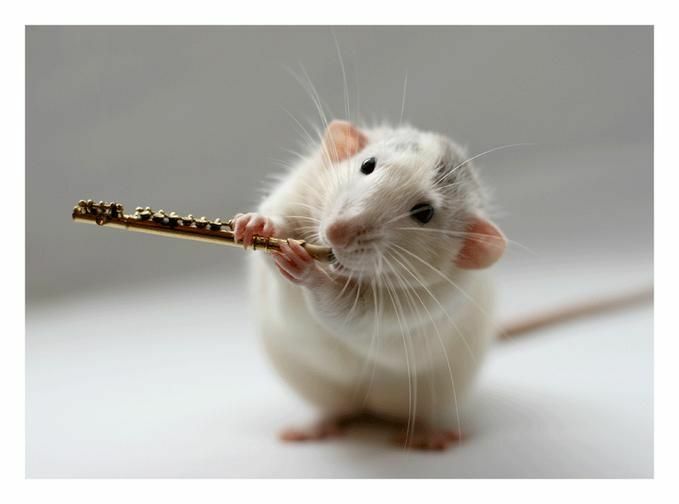 Movement 3, "Kein Arzt ist außer dir zu finden" (Besides You is no doctor to be found) is an aria for alto with the obbligato flauto piccolo, which according to Mincham, employs a "figuration ever striving upwards, moderates the underlying sense of potential tragedy". The alto recitative "marks a change of scene", it begins in B minor, like the opening chorus, but modulates to D-major and ends with a wide-ranging coloratura marking the word "Freude" (joy). Movement 5, "Erholet euch, betrübte Sinnen" (Recover now, O troubled feelings), picks up the joyful coloraturas, supported by the trumpet and fanfares in triads in the orchestra, Mincham notes that the trumpet "bursts upon us with an energy, acclamation and jubilation unheard, so far, in this work". The cantata is closed with a four-part setting of the chorale, sung to the melody of "Was mein Gott will, das g'scheh allzeit" which Bach used frequently, including in his St Matthew Passion. 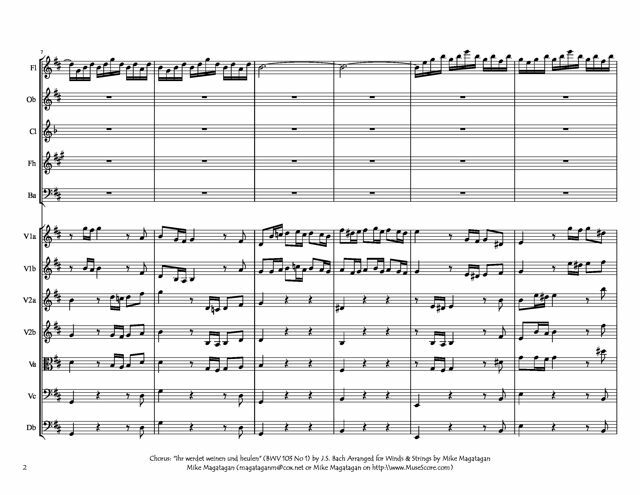 The cantata in six movements is scored for three vocal soloists (alto, tenor and bass), a four-part choir, trumpet, flauto piccolo (descant recorder in D), two oboes d'amore, two violins, viola and continuo. 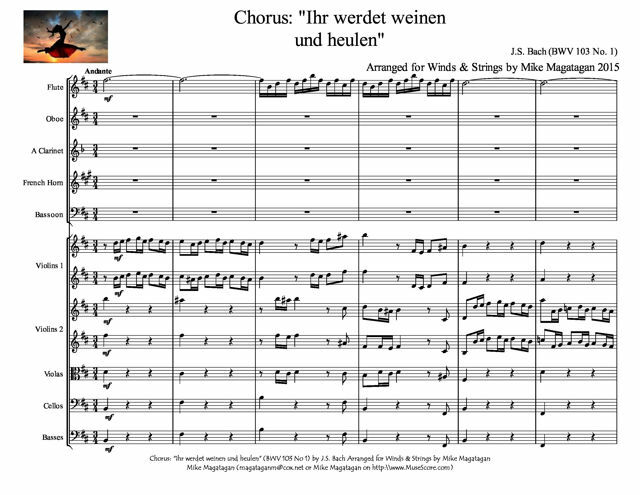 I created this arrangement of the opening Chorus & Arioso: "Ihr werdet weinen und heulen" (You shall weep and wail)for Winds (Flute, Oboe, A Clarinet, French Horn & Bassoon) and Strings (4 Violins, Violas, Cellos & Double Basses).